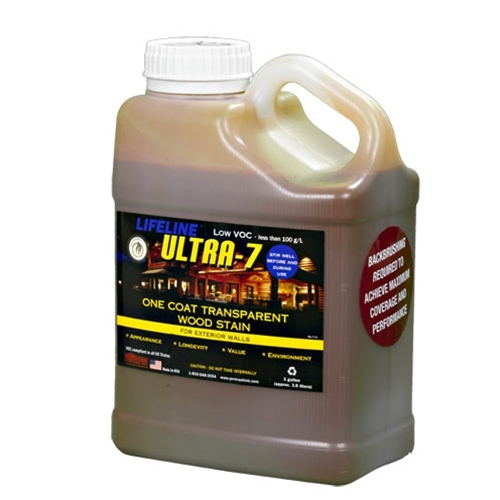 Lifeline Ultra-7 is the most durable exterior stain that Perma-Chink Systems has ever developed. 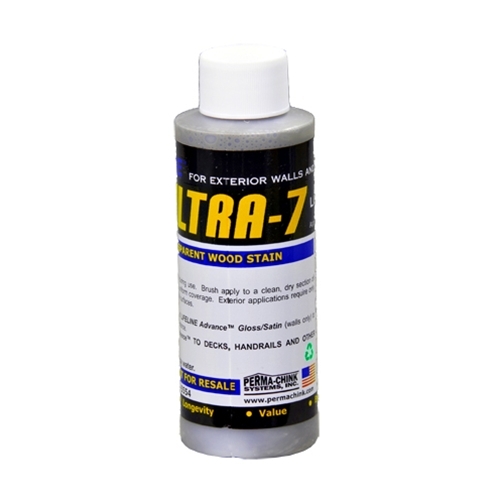 After multiple exposure tests in harsh weather areas across the country (think snow country, the sunny southeast and extreme mountain locations), Lifeline Ultra-7 stands out as THE top-of-the-line, long-lasting finish. The secret behind its durability is Lifeline Ultra-7’s state-of-the-art resin that creates a flexible and tough seal on your home’s logs. Perhaps more importantly than the seal’s strength, the resin also ensures that the seal is continuous, providing protection from holes and gaps that might otherwise develop with a lower-quality finish. In addition it has unsurpassed adhesion to wood. It’s this continuity that has proven to be much more resistant to UV degradation, color fading and adhesion loss. And just like all Lifeline finishes, the water-resistant film breathes just like Gore-Tex® to allow trapped moisture to evaporate from your logs. Richard on 04/01/2019 - "It's not cheap but it performs very well. Easy to use and provides consistent appearance and coverage." Al on 03/11/2019 - "This is a great product. The best part so far is that a little of it goes a long way." Brian on 11/02/2018 - "We used Smoke Ultra 7 with Brown chinking for a more rustic look on this Colorado Home so the home would fit into an older neighborhood and not look out of place. Very pleased with color, sheen and overall quality." Mara on 11/02/2018 - "We stained the cabin three years ago but it look like we did it yesterday, and we still get compliments from the neighbors." Jon S. on 09/04/2018 - "This house hadn't received the maintenance it should have for a long time it amazed everyone that looked at it as I did the job of cleaning it up, using ReNew then ShellGuard RTU, followed by Lifeline Ultra-7 in Carmel and Lifeline Advance Topcoat. The house looks like it's new." Rich L. on 01/09/2018 - "I have been to the store in Rice, MN several times now, latest being in July 2017. As I've told those folks there, I'm not in the log home restoration business, but when asked, I suggest the product line of Perma-Chink Systems. I have used your products on my own log garage (haven't built dream log home yet), and was impressed with the ease of applying, and the durability. Have shared the results with several people looking to do restoration on their own. Looking forward to 2018 and sending more clients your way!" Rick P. on 06/21/2017 - "Just wanted to thank you for your great personal customer service and for the outstanding products that Perma-Chink Systems offers, they are without a doubt the highest level of quality that I have ever used on my log home. Thank You to ALL of the Perma Chink people for your excellent products and excellent customer service. " Dave H. on 1/23/2017 - "We chose Ultra 7 since it's one coat and a clear top coat and most of the logs look great. The south side logs didn't turn out as well because they were dark from high elevation (5,800') sun damage and we didn't correct that first so it was our fault. PCS is the 3rd company we tried and we like it best. Three years now and the logs still look new and we look forward to see how good the south side will look when we prepare the logs properly. We'll use the same products next time." Ray D. on 12/15/2016 - ”The finish on my cabin was grey and quite dirty. I used the Wood ReNew as directed. I couldn't believe it. Then we put in the backer rod and chinked it. Put on Ultra7 and top coated. Your products worked as promised. Great directions. I've been in construction 35 years. Almost nobody tells the truth anymore." "From a very happy customer"
S Okino on 01/30/2016 - "The best log sealer ever! Easy to apply. I will use it again:-)"
M Wallace in CA (07/10/2015) - "Ultra 7 is great. I love that its just a one coat stain, and already has UV protection in it. J Cornell in WA (06/31/2015) - "Great product but giving three stars because it's pricey!" M Buford in TN (03/24/2015) - "I love the Ultra-7 (one-coat stain) followed with one-coat of Advance (topcoat). It makes the house look beautiful in a lot less time, what a great product!" J Wilmes in TX (03/12/2015) - "Ultra-7 looks great!" C Washburn in WA (02/25/2015) - "I've used three generations now of your exterior finishes. I recommend your system to everyone that asks. I really like that your finishes are eco-friendly. The price up front is a little high but when you think about material costs plus maintenance costs its worth it." B Corvey in AL (09/25/2011) - "We used Lifeline Ultra-7 on our home and I cannot believe how beautiful it looked once the Lifeline Advance was applied. It added a sheen which really made the color pop and added some depth to the color as well. Awesome product to work with." S Merriam in TN (07/27/2014) - "After much research, I used Perma-Chink Ultra 7 last summer. I'm in Maine, and it still looks perfect one year later. There's no mildew and no problems. I used the oak color, which ironically gave me the best cedar color on my Western Red Cedar logs. My log railing guy uses Perma-Chink and he loved my color, but never thought of using the oak color on cedar. I have a co-worker in Maine with a pine home, and her husband only uses Perma-Chink on the logs." J Aarons in MA (08/11/2013) - "I did my homework and I honestly found the best stain on the market. You can see the quality of the product right from the first brush stroke. No bad smell at all…not when you first open it, not while you are applying it and no lingering smell once you’re finished staining. Dried fast, so I finished fast."